This blogger reviews this book, using the Gallaudet protest as an example of the themes contained within the book. I’ve posted part of the review here, and the rest can be read at the link provided at the end. 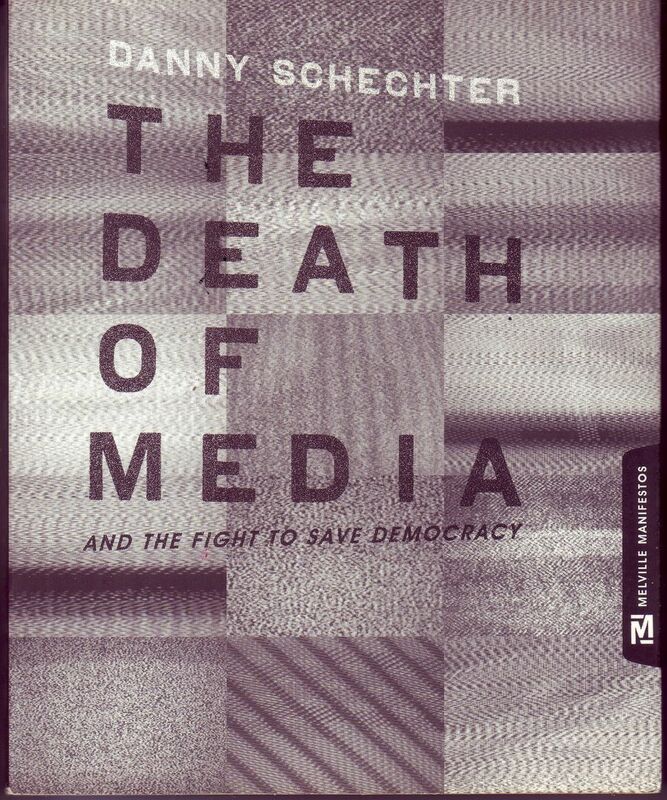 One-hundred and seventy-three pages, smaller (in shape) than a greeting card, but packing a punch you may not expect, Danny Schechter‘s The Death of Media [and the Fight to Save Democracy] is a must-read. We discussed the book back in February. Instead of discussing it, let’s utilize it. Schecter surveys the landscape today and notes what’s dying and what’s coming to life. He also notes the efforts to curb and control new life. Mainly, he puts the ‘you’ front and center. Before you sound the alarms, this is reality. The percentage is what people think. Though Susan Seaforth Hayes will sneer at what people think (“If only they were as smart as me!” you can practically hear him whine), it’s reality. In one form or another, on topic after topic, there’s a we-know-best attitude that only gets dropped when it’s time to hide behind a governmental official (current or past). The little ‘peons’ are either scorned or otherwise unremarked upon. We don’t think that cuts it. Thanksgiving weekend, a friend of C.I.’s was reading the book and called to say there was “a strong thread of Howard Zinn” in the book. That wasn’t an insult or an attempt to say, “He ripped off Zinn!” That was acknowledging that The Death of Media [and the Fight to Save Democracy] is about what the press could and should be if we the people actually mattered. There are many examples throughout the book but we’ll zoom in on the ‘decision makers’ who decide that the people/peons just aren’t interested in international coverage because the world doesn’t interest them. The reality is that polls demonstrate otherwise. But this we-know-best-because-they-aren’t-as-educated-as-us attitude is on display in that decision and in far too many media outlets — big and small. ‘People don’t care about the war.’ ‘Truth’ most infamously pushed that on her laughable radio appearance where, unlike Robert Parry, she hadn’t done her homework on any issue and attempted to gas bag her way throughout. Gas baggery was all that laughable claim was. People don’t care? Well election polling demonstrates otherwise. But that’s been the cry of the media, big and small, for some time. Last Friday, Reuters did an article on how students don’t care about the war and won’t unless there’s a draft. They trotted out an old fogey for that piece of if-we-keep-repeating-this-conventional-spin-it-will-be-accepted-as-fact. Before the next gas baggery is done, try leaving the desk. Try getting out onto a campus. Now if you’re of the crew that can’t find student activism unless you stumble across some Eisenhower Democrats, don’t expect to hear from students. They don’t trust you, they’re sick of you and they’re tired of your attacks on them. But if the media covered things as if they mattered, as opposed to rushing to assure us nothing is happening, then where might the student activism be, where might the peace movement be? Desk jockeys rarely show up at teach-ins or rallies but damned if they don’t feel they know enough (if not all) to write about students. We’ve said it before and we’ll say it again, the coverage has been poor. 2006 is one of the worst years in recent time. And guess what, we’re talking small media. GALLAUDET WILL PROCEED WITH ACTION AGAINST PROTESTORS Gallaudet University will proceed with disciplinary actions against student demonstrators who forced the ouster of the university’s president, trustees said. The trustees’ decision, made after a one-month suspension to review amnesty pleas, may mean academic penalties for the 125 students who helped shut down the campus in October to prevent the appointment of Jane K. Fernandes as president. The decision threatens renewed turmoil on cmapus in Washington, D.C., less than a week after the university named Robert R. Davila, a former Education Department official, as its interim president. Gallaudet? Well we covered it. Outside of Democracy Now!, where was independent media? Where were any of the gas bags who repeatedly whined/bemoaned that nothing was happening over and over? The protests didn’t start in October. They had been going ongoing for months and months. How do you render the students of Gallaudet invisible? Is it that they’re ‘different’? Are you uncomfortable if you have to address someone who’s not just like you? Did the idea of signing (or learning to sign) frighten you?